Our Easter dinner was enjoyed last night, on Saturday evening. The day was beautifully sunny and I spent all morning working in the yard, digging out weeds and thinking about what plants needed moving. I pruned the roses and had Tim dig a couple of them out - they have never done well and after two years of neglect were mostly dead. On the dinner table I sprinkled candy chocolate eggs but I might have to rethink that strategy as the Little Miss wouldn't be deterred once she saw the rest of us eating them. A small chocolate bunny marked each place, along with two bunnies huddled under the flowers in honour of the Adventurers who spent a quiet Easter in Istanbul. The garden is showing colour here and there - mostly grape hyacinths, a few daffodils and lots of dandelions, which I included in the vase on the table. Soon there will be tulips. I hope you have had a wonderful Easter weekend, celebrating quietly or with friends and family. I've enjoyed a break from the computer and hope to catch up with some blog reading this week. Linking to Mosaic Monday with Mary at the Little Red House. Spending quiet time in the garden and with family members has got to be the very best way to enjoy the Easter break. A local gardener told me recently that I should wait until the dandelions are flowering before planting seed potatoes. Thought I'd pass that along just in case you were thinking of growing some spuds this year! 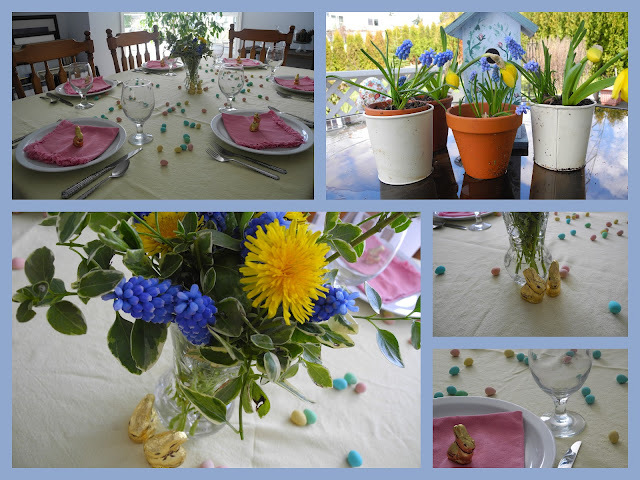 Cute tablescape for Easter. Your garden sounds lovely. Mine is off to a slow start. Hope you had a Happy Easter and I wish you a great week ahead. We had so much fun over the Easter holiday but the weekend ended with a long drive home :-(. Working ing the garden sounds heavenly! I love the way you've included the dandelions in your bouquet of flowers Lorrie. When we first moved to the farm we seemed to spend hours trying to dig them out of the lawn but now the brilliant colour is a welcome sight as they are sometimes the first spring "flowers" to bloom after the long winter. I hope your two who are away will be home before too long. Glad you are enjoying your spring gardening! Your mosaic is lovely and your little miss is adorable. Thank you for stopping by. I love your very festive blue, yellow and pink color scheme on your holiday table, Lorries. I would ahve also wanted to eat the chocolate eggs and bunny as soon as I saw them ... very sweet idea! I hope you had a very Happy and Blessed Easter! What a lovely table setting for Easter! The grape hyacinth and tulips are so cheerful and pretty. Such a delightful table you've set, and I'm sure some lovely family memories were gathered to your hearts there. Gardening is such good therapy. I can spend hours outside just puttering around doing whatever the garden requires. Sounds like you had a lovely day and a wonderful evening. Oh my gosh...I could not resist the cancy chocolate eggs...they would be gone sooo fast that the Little Miss wouldn't have even seen them ! :) Thanks for stopping by and leaving such a nice comment on my blog. Beautiful mosaic! Glad you had a lovely Easter.... we did, as well.Love the little bunnies representing the Istanbul couple! Yes, it really is springtime...the dandelions are here! It sounds like you had a perfect Easter weekend...a mix of family, gardening and enjoying the beauty of the season. Happy Easter Monday to you! Such a lovely mosaic you have put together, Lorrie. Glad you had some puttering time in the garden. Nothing quite like it. What a beautiful table! I love the sprinkles of candy. Everything looks so spring like. Beautiful table! So pretty! Looks like a wonderful Easter at your house. Oh I think the chocolate eggs make a lovely touch! What a pretty table. Next year, Little Miss will be all set! The table looks lovely! And it was nice you could have a special meal on Saturday, giving you a more relaxing Sunday! It's a challenge to get a big meal together for after church on Sundays! You set a lovely table for your Easter feast, Lorrie. The floral arrangement is so colourful.